Slovenia and Croatia are the northernmost countries of the Balkans, which boast astonishing natural beauty of the Alps and the Adriatic Sea combined with unique urban vibes in Ljubljana and Zagreb. This tour is optimally planned to show you the best highlights of these neighbouring countries at a pleasant pace. 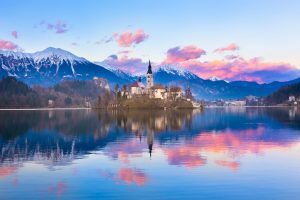 Our multi-day tour package Best of Slovenia & Croatia includes visiting Slovenia’s and Croatia’s greatest attractions with local professionals, who will show you the best of these countries. From Ljubljana, Lake Bled, Postojna Cave and Predjama Castle, to Zagreb, Plitvice Lakes National Park, Split and Dubrovnik, you will discover that the natural beauty of these places is out of this world. Paired with fascinating stories about history that took place in these lands, this is the adventure you simply must add to your bucket list! Slovenia is a country full of natural treasures, as nearly one third of Slovenia is under natural protection and 60 % of it is covered with forest. Wherever you go, you will be surprised to find the sea so near the Alps and the Karst, the Pannonian Plain will soon change into vast forests, and the cultivated fields will transform into hills, covered with vineyards and fruit trees. The inhabitants of the “Green Heart of Europe” are hospitable, kind and hardworking. Slovenian towns are relatively small and never more than one step away from nature. Our agent will welcome you at the Jože Pučnik Airport Ljubljana and take you to your hotel for check-in (after 14:00). 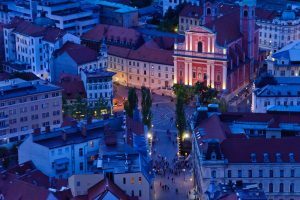 You will have time for unpacking and lunch and in the afternoon, our tour guide will take you on a panoramic sightseeing tour of Ljubljana, proclaimed by the European institutions the »European Green Capital 2016«. 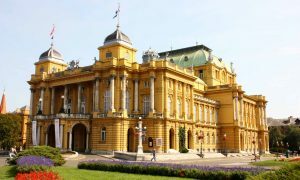 To feel its cosy urban vibe, we will walk through the scenic Old Town and see its main attractions, from Prešeren Square and Tromostovje (Triple Bridge) to Town Square with its baroque fountain and Town Hall. We will walk up the Ljubljana Castle Hill and admire its panoramic view of this lovely city. Overnight stay in Ljubljana. In the afternoon, we will drive to another part of Slovenia – Gorenjska (Upper Carniola) Region – to the most renowned tourist place in Slovenia, Lake Bled. As Bled is a place for relaxation and enjoyment, you will hear all the relevant stories, facts and directions/tips on the way and learn more about Bled upon arriving there. You can decide how you want to spend the next few hours at leisure at the resort by yourself and choose from the possibilities you will learn about. Our guide can take you on a tour of the majestic Bled Castle (optional), which is located on a steep 139 m high cliff overlooking the lake and offers a heavenly view of Lake Bled, as well as the surrounding alpine mountaintops and valleys. Bled Castle, first mentioned in 1011, is one of the oldest Slovenian castles. You can admire the old wooden Gutenberg printing press and the castle’s smithy, while Bled Castle is also famous for being one of the most beautiful wedding venues in Europe. Alternatively, you can take a pleasant walk around the lake or join a “pletna” boat ride to the island in the middle of the lake, which is named after the town of Bled and is, in fact, the only island in Slovenia. You can take a look at an impressive medieval church and its “wishing bell”. After that experience, you can take some time to treat yourself to a good cup of coffee, enjoying the beautiful view of the lake at the foot of Pokljuka and tasting the traditional local dessert “kremšnita” (cream cake), which has been made in Bled for over 60 years. Another possibility is visiting the magnificent Vintgar Gorge nearby (typically open between April and November). Return to Ljubljana in the evening, overnight stay in Ljubljana. After breakfast, we will leave Slovenia and drive to Zagreb. After check-in, you will have time for unpacking and lunch, which will be followed by a light walk downtown with a panoramic city tour. We will see Donji grad, Kaptol with the Zagreb Cathedral, the largest church in Croatia, Gornji Grad, Bloody Bridge, Stone Gate and St. Mark’s Square. Overnight stay in Zagreb. After breakfast, the road will lead us through the town of Karlovac, which is named after its founder, the Austrian archduke Charles II Habsburg. We will continue along the valley of the Korana River to Slunj and towards the Plitvice Lakes National Park. This natural beauty presents sixteen lakes in beautiful blue-green pastel colours, which reflect the surrounding forests. The water in the waterfalls flows from lake to lake, creating a unique landscape. Plitvice Lakes National Park is listed as one of the natural heritage sites on the UNESCO World Heritage List. Our journey will continue towards the Adriatic Sea and along its shores to Croatia’s second largest city, Split. Overnight stay in Split. After breakfast, we can visit the Klis Fortress, where the Game of Thrones was filmed (optional). We will descend to the ancient amphitheatre ruins in Solin. 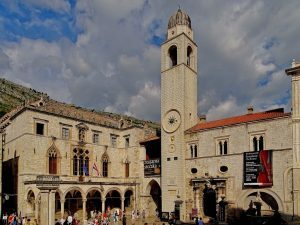 In the afternoon, we will go on a sightseeing tour of Split and visit Diocletian’s Palace, which is on the UNESCO World Heritage List. At the beginning of the 3rd century, it was built by the Roman emperor Diocletian, born in the town of Solin near Split. A walk around the 1700-year-old palace is actually a walk through the heart of today’s Split. On the central square called the Peristil, we are actually standing on the original cobbled almost two thousand years old Roman street. We will also see the Temple of Jupiter, Cathedral of Split, St. Domnius Liberty Square or Prokurative and much more. In the afternoon, you will have some free time to explore the city by yourself and feel its vivacious vibe. Overnight stay in Split. In the morning, we will head towards the coastal town of Neum, where we will pass the Republic of Bosnia and Herzegovina for 5 km, and then return to Croatia. We will continue on the scenic coastal road along the Pelješac peninsula and pass through the Elaphite Islands to Dubrovnik. We will explore the city, which is the pearl of southern Dalmatia, an old town listed on the UNESCO World Heritage List. We will experience the charm of the remaining buildings from the time of the old Dubrovnik Republic, enjoy the view of the Renaissance architecture with some traces of Gothic, see the Franciscan monastery with one of the oldest pharmacies in Europe, the central street Stradun, the Sponza Palace and the church of St. Blasius, a majestic cathedral. Overnight stay in Dubrovnik. Day at leisure in Dubrovnik. 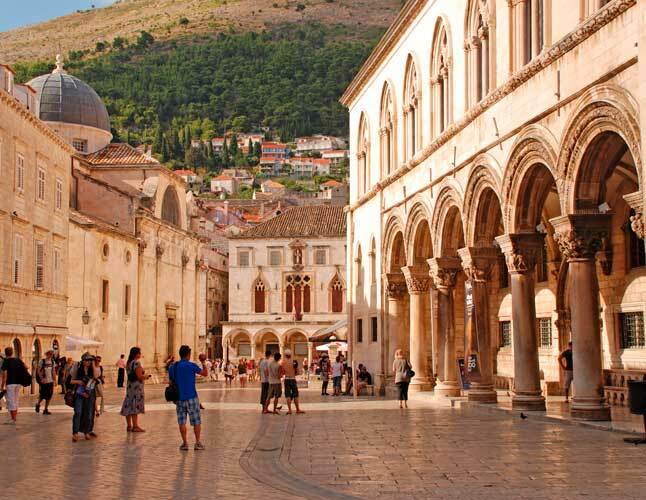 2 nights in Ljubljana, 1 night in Zagreb, 2 nights in Split, 2 nights in Dubrovnik. Our tour guides can take you on sightseeing tours of Ljubljana to show you its main attractions, from Prešeren Square and Tromostovje (Triple Bridge) to Town Square with its baroque fountain and Town Hall. Another thing you cannot go without is climbing the Ljubljana Castle Hill and admiring its panoramic view of this lovely city. As the most photogenic place you can visit in Slovenia, Bled offers breathtaking panorama. The best view is inarguably from the Bled Castle, but there is a lot to see down by the lake, too. The traditional pletna boats are known as the “gondolas of Bled”, beautifully crafted by the locals. If you are in a pampering mood, you can take a lovely ride with the coachmen Fijaker – a special Bled tradition on its own. The illuminated trail leads through the Great Mountains (Kalvarije) across the Russian bridge, built by Russian prisoners during World War I in 1916, to the beautiful Tubes’ Hall, White Hall and Red Hall – until Brilliant Passage, where the most famous stalagmite Brilliant, the symbol of the Postojna Cave, is located. In a large concert hall, you can see an aquarium with human fish, the most famous cave animals in the world. This natural beauty will amaze you with 16 lakes in striking blue-green pastel colours. The mineral-rich water flows from lake to lake, creating a unique landscape with beautiful waterfalls and cascades. The park is heavily forested, providing a refreshing natural environment for you to discover. Visiting the Tivoli Park is a must! You can walk under the oak trees, see an open-air exhibition and feel the care-free urban vibe there. You can take a Ljubljanica Boat Cruise, go SUP-ing or treat yourself to some gelato in one of the ice-cream shops. The best cafés and restaurants are found in the Old Town, laid-back during the day and full of life and lights during the night. After the initial amazement, you can take a closer look at the lake, watch the peaceful sailing of the swans, chill on the beach, look out for local craft and have a delicious lunch. You can go rowing on Lake Bled or swimming during warmer months. The best way (or the only way?) to conclude your visit is by tasting the Bled cream cake, one of the symbols of Bled! 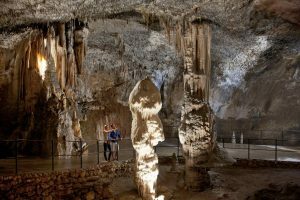 Guided tour of Postojna Cave includes walking and driving by an underground train, where you can admire 5 km of tunnels, passages and spectacular halls. By Hotel Jama in front of the cave, you can visit the souvenir shop and get a baby dragon of your own. Enquire about additional experiences and activities in the area! It takes about 6 hours to explore the park on foot. If you don’t have that amount of time, you can explore the upper lake section, which takes 2 hours. Plitvice Lakes National park is perfect for relaxation and contemplation, as the nature is truly astounding. It is also popular for bird watching and hiking. Note that swimming is not permitted in any of the lakes.